All our chalets are located in the wonderful alpine ski village of Meribel Les Allues, a charming, traditional Savoyard village and just a few minutes from Meribel centre. It is fully linked to the world famous 3 Valleys. The largest and quite simply, best linked ski area in the world, 600km of slopes and almost 200 ski lifts. So you can ski the mighty 600km of slopes yet stay somewhere picturesque and truly special. High altitude skiing, snowsure and with an exceptional variety of terrain, it caters to all ski levels. Experience the unique atmosphere of this picturesque village setting, it is the perfect mixture of tradition and great wintersports. Les Allues offers all the charm of an authentic and unspoilt French village, yet is only a few minutes from the heart of one of the world’s top ski destinations. 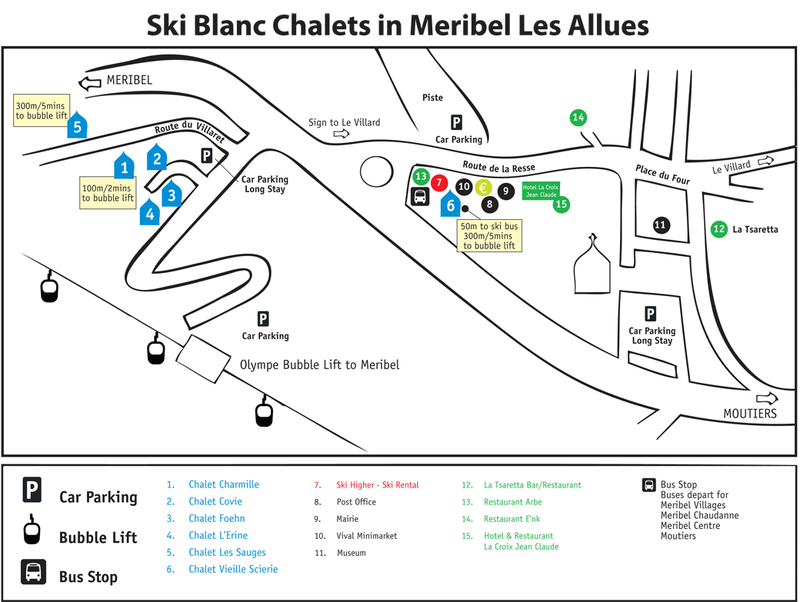 Meribel Les Allues offers you quick access to the slopes: Linked by a fast 6 seater gondola, it takes you directly to the central lift station – La Chaudanne in Meribel centre. It very often gives easier access to the slopes than many chalets in town, due to the spread out geography of Meribel centre means ski in/ski out is rare with access to lifts more often than not by shuttle bus. All 6 chalets are within 100-400m walk from the ski lift and ski bus stop. For some of the winter it is possible to ski back to Les Allues, via a gentle run through the trees. Snow conditions permitting. Meribel Les Allues has combined the charm of its historical past with the tasteful construction of a selection of shops, ski hire, bars & restaurants. There is a choice of excellent local restaurants close to the chalets, which you can sample on the staff day off. The Tsaretta bar and restaurant is always a popular après ski venue where live British bands play both before and after dinner.